1) Online guide Make your digital resources easier to discover: a web-based resource for creators and managers of digitsed and digital resources packed with practical tips on how to improve the discoverability of their collections, arranged under broader categories such as “Make Google searches work for you“, “Use social media” and “Learn to use content aggregators“. 2) Final report with recommendations for above-campus interventions to support discovery of digitised collections. 3) Technical specifications for tools to support collection managers with tasks that would make discovery of content easier. 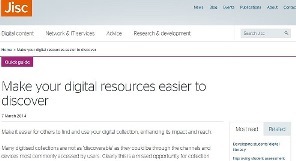 4) Web-based assessment of the discoverability of a sample of 177 digitised resources over the last 15 years from major publicly funded programmes such as the New Opportunities Fund, the AHRC resource Enhancement programme and a variety of Jisc digitisation and content programmes. 5) Literature review on online user behaviours in resource discovery, compiled from studies and reports published in the last 5 years. A big thank you to all those who have participated in the project, a list of people and institutions is at the back of the Final report. Jisc received funding for Phase 2 of the project which is about to start. Updates will continue on this blog. Posted by Paola Marchionni on June 3, 2014 in #JiscSpotlight2, #spotlight.